Every once in a while we come across a video so outstanding that words simply cannot do it justice, but we must have it! 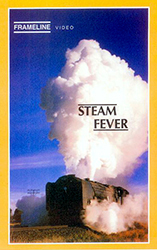 This was our experience with "Steam Fever," produced by Ron Nell, a South African who was compelled to record the great steam drama still being played out with modern 4-8-4s on the Kimberly-De Aar main line. Touched by the almost universal appeal of steam, he has displayed the sensitivity and creativity needed to explain that appeal to others through the medium of motion picture film. The images he presents evoke both raw emotions and subtle nuances of the steam experience for both railfans and civilians. This was professionally photographed and released in South Africa in 1992. Sunrise, sunset, fast running and servicing duties shots abound. There are precious light-hearted moments, too, as he turns his camera on railfans and their seemingly antic and frantic pursuit of the steam quarry. Produced by Frameline and distributed in the USA by Goodheart Productions.